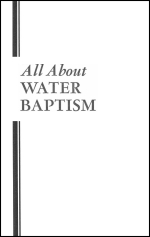 IS WATER baptism essential to salvation? What about the "thief on the cross?" Was he saved without it? What is the proper form, or mode - sprinkling, pouring or immersion? Should babies and children be baptised? Suppose you were baptised by a minister you have since lost confidence in. Should you be baptised over again? Suppose you were baptised "in the name of the Father, and the Son, and the Holy Ghost." Should you be baptised again "in the name of Jesus only?" Should one be baptised immediately, or only "after a six months' probation?" Must the ordinance be performed by an ordained minister? We are saved by GRACE, and through FAITH - make no mistake about that; but - there are conditions!